Development and preservation are constantly locked in a dance, with each party trying to lead. But the two can successfully coexist, as projects like 1K Fulton, Londonhouse and the Chicago Athletic Association Hotel have proven. Preservation Chicago executive director Ward Miller told Bisnow his organization shies away from commenting on redevelopment projects and gets involved only when it becomes clear that a development can severely impact the character of a landmark or historic building. Miller considers repurposing these buildings for modern use the most sensitive type of development, and Preservation Chicago is often an intermediary between developers looking to make their projects a reality and residents who are concerned about how future development activity will change the character of their neighborhoods. Miller said that Preservation Chicago encourages investment in historic and landmark buildings, as they can lay the foundation for building better neighborhoods in the future. One recent preservation success story: Clayco’s decision to incorporate the historic Weyland Building at 1970 North Milwaukee (shown) in Logan Square as part of a multifamily development. Miller, a 20-year resident of Logan Square, said the new low- to mid-rise TOD activity along Milwaukee Avenue has negatively impacted the character of a neighborhood long identified by two- and three-flats, and smaller apartment buildings. Clayco wanted to demolish the Weyland Building, as it had structural issues, and build an eight-story tower. Instead, Clayco will incorporate the building into the project. It’ll still build an eight-story building on adjacent lots, but it will be set back farther from the street and away from the eyes of passers-by. During his time in Logan Square, Miller has helped get two areas landmarked and facilitated the purchases of the Comfort Station and Hairpin Arts building, which are now part of a robust arts community in the neighborhood. He’s also helped keep newer construction built on a scale that complements the existing architecture. While Miller would ideally love to see historic buildings completely preserved, he understands that can’t always happen. Take what’s happening in Fulton Market. Although the Landmarks Commission approved the creation of the Fulton-Randolph Historic District in 2015, it’s mainly intended to preserve and protect the external features that make Fulton Market a unique pedestrian experience, like building elevations and their original façades. Several of the buildings in the district were severely damaged by fire or have structural issues, or are literally being held up by their facades. Developers in Fulton Market have been creative. They’re building new buildings behind the façades and there’s a lot of infill activity along vacant parcels and non-contributing buildings not included in the district’s timeline of significance. Miller told us there is brisk activity with repurposing the upper levels of boarded-up buildings nearby, an indication of how a landmark district can spur development. 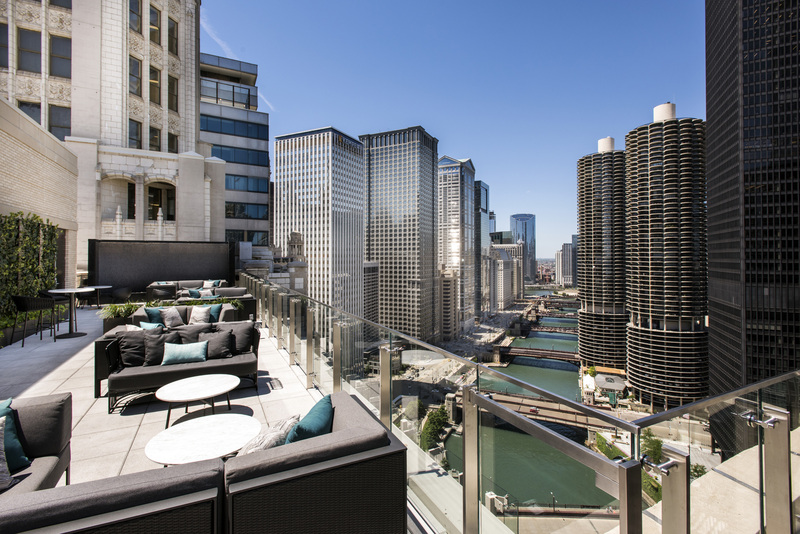 Miller has been especially impressed with how downtown buildings that represent the first school of Chicago architecture have been adapted into hotels and apartments. Tax incentives have helped with the preservation of buildings like Londonhouse (shown), the Chicago Motor Club and the New York Life Insurance building at 39 South LaSalle. Preservation Chicago lobbied the city to grant landmark status for that building and the adjacent 19 and 29 South LaSalle. The New York Life Insurance Building is now a Kimpton hotel, and 29 South LaSalle is being redeveloped into apartments. Miller’s focus Downtown is now on preserving the very small buildings in the Central Loop and River North, mostly four-story structures. He said the pace of River North development has contributed to a skewing of scale, with larger apartment and office buildings standing side-by-side with older, historic four-story buildings. Preservation Chicago is also working to have religious buildings preserved. It’s fighting to save the façade of Pilgrim Baptist Church in Bronzeville, which is preserved as part of an open-air amphitheater, and was successful in getting three Catholic churches preserved. One, St. Boniface, is being converted into multifamily.